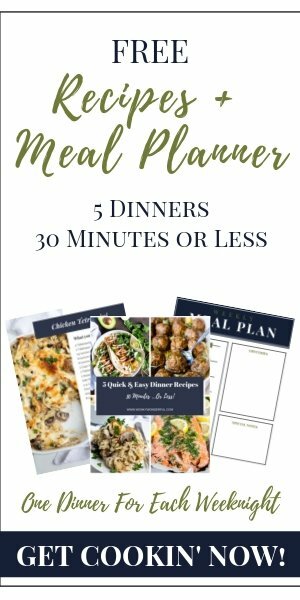 Busy weeknight dinners just got easier. 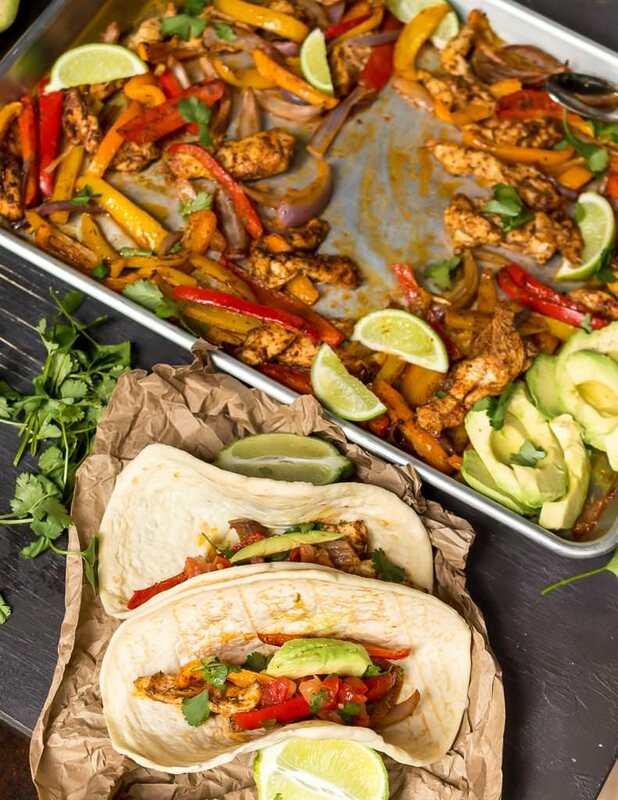 These Sheet Pan Chicken Fajitas are nutritious, easy, tasty and ready in 30 minutes or less! If you’re craving Mexican food, skip the restaurant and make your fajitas at home. This recipe is Paleo compliant, Whole30, Dairy Free, Gluten Free and Grain Free. I decided to solve this problem and began working on several new recipes. The first and most obvious being these Sheet Pan Chicken Fajitas. This is a great weeknight dinner recipe because it only requires a bit of slicing, then toss everything on the sheet pan. Boom . . . Done. Can you prepare this meal ahead? Yes! Pre-slice the chicken, onion and peppers then place them in a bag with the oil and spices. Refrigerate until ready then proceed to follow cooking instructions. This also makes fantastic leftovers which is why it is perfect for meal prep. 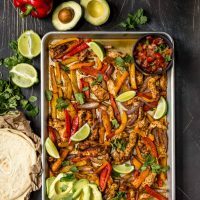 How should you serve these Chicken Fajitas? Don’t forget the extras: avocado, cilantro, limes and pico de gallo! You will need a Rimmed Baking Sheet . These Chef’s Foundry Ceramic Knives are great for slicing, cutting and chopping! This is great for meal prep, I use these Glass Meal Prep Containers with Lids . If you can find pre -sliced chicken or peppers at your grocery store, this is a great time saver! The thinner you slice the chicken and peppers, the quicker this meal will cook. If you’re in a hurry be sure to slice everything on the thinner side. Feel free to add green bell pepper to this recipe. I just don’t prefer the green peppers so I leave them off. If you are sensitive to spicy, just omit the cayenne. Busy weeknight dinners just got easier. 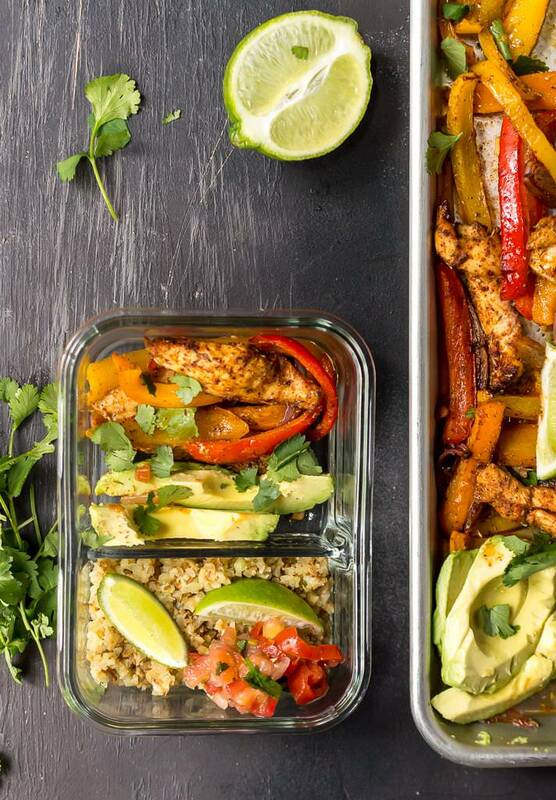 These Sheet Pan Chicken Fajitas are nutritious, easy, tasty and ready in 30 minutes or less! 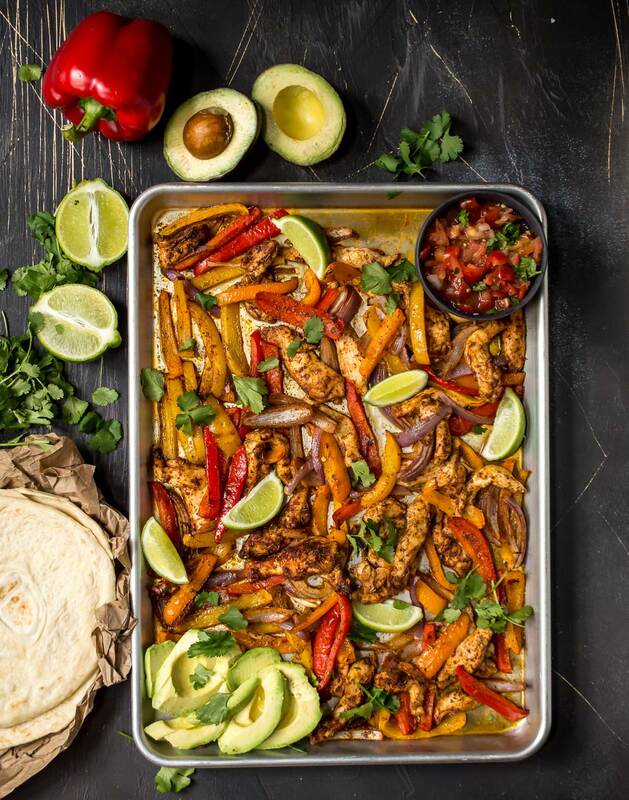 If you're craving Mexican food, skip the restaurant and make your fajitas at home. This recipe is Paleo compliant, Whole30, Dairy Free, Gluten Free and Grain Free. In a large bowl, toss all ingredients together. Transfer to a greased, rimmed baking sheet. *optional* Broil on high the last 2-3 minutes to get a little golden brown on the chicken and peppers. Serve with tortillas, over rice, with quinoa or over cauliflower rice. Extras: Avocado, limes, cilantro and pico de gallo. Sheet pan meals rule!! I love all the color in the recipe and I bet the flavor is amazing! Thanks! I need to do sheet pan dinners more often!